After a long day of work, meetings, driving, shopping, laundry and walking the dog (that part was fun), it was a pleasure to come home and cook up a pot of Liberian Collard Greens and Chicken Peanut Stew. While it wasn't the most exotic or exciting of the many meals I've cooked thus far, it was simple and healthy, and that works for me. 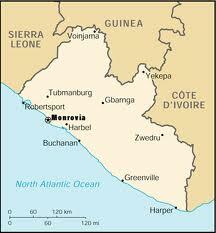 Located on the west coast of Africa, Liberia is bordered by Sierra Leone, Guinea and the Cote d'Ivoire. Liberia's history is remarkable as it was founded and colonized by freed American slaves with the help of a private company, the American Colonization Society, in 1821. Liberia is Latin for the word "free." Tragically, in 1980, several civil wars erupted, from which the country has yet to recover financially. It is estimated that about 85% of Liberian's live on $1.25 per day. Cuisine in Liberia is heavily influenced by African American as well an native cooking traditions. The country's hot equatorial climate is home to crops of cassava, peppers, sweet potatoes, tomatoes, ginger, palm oil and sugar cane.Greens along with rice and fufu are typically served alongside most meals which might consist of fresh, smoked or dried fish, beef or chicken, but in far less quantity than eaten in Western countries. Brown chicken on both sides in oil in a large heavy pot. Add salt and water to pot and bring to a boil slowly, removing any scum from top with a slotted spoon. Simmer for 20 minutes. Mix peanut butter with 1/2 cup of the chicken stock and add back into the pot. Add remaining ingredients, cover and simmer very gently for about an hour, stirring occasionally. Saute bacon until browned, than add onions and spices and saute until onions are golden. Add collard greens and water, then correct seasoning. Cook for 15 minutes until vegetables are tender. Strain before serving. Final Assessment: Both the chicken stew and collard greens were tasty and easy to make. The hot pepper flakes added to the greens and cabbage gave them a nice kick. The chicken stew could have been a little thicker, so I decreased the amount of water in the original recipe. A straight forward and satisfying meal indeed.